What a busy weekend! With all the party planning and Easter preparations complete, I can finally pause for a moment and post the pics from the Alice party. 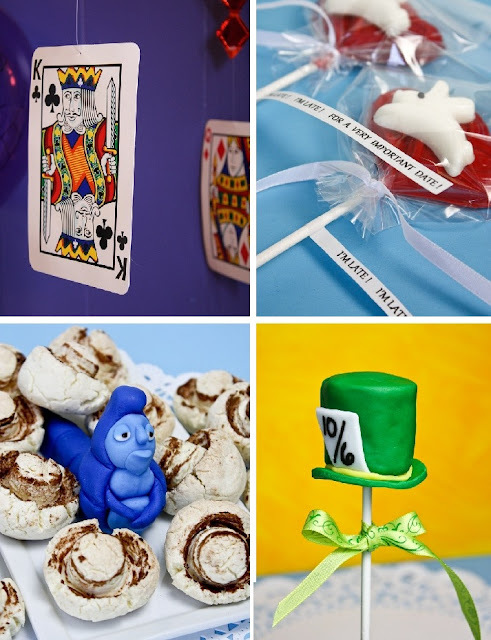 We had a wonderful time, and although I did not get as many pictures of the actual party as I would have liked, I did take many pictures of the goodies I made beforehand. Harper the birthday girl, and one of my dearest friends Carrie (her Mom). 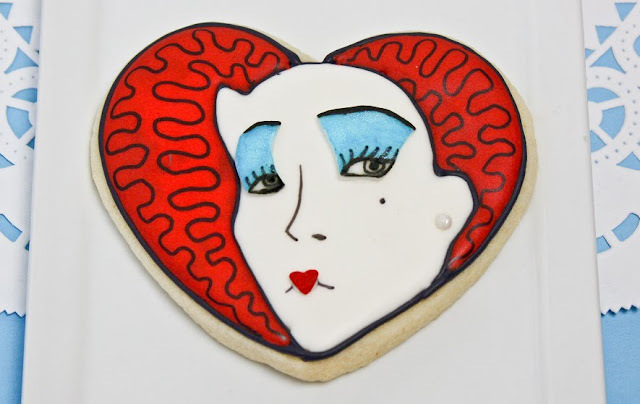 An idea I had early on was for a Queen of Hearts themed sugar cookie. Luckily Carrie let me make whatever felt right creatively. I drew the Queen's eyes with a Wilton Color Writer on pieces of thinly rolled and cut-out fondant. This allowed me to place, adjust and adhere the eyes to the position that looked best. Her earring is a pearlized nonpariel, and her lips, a heart-shaped sugar confetti. No two cookies were alike because I had to free-hand each face. I kinda liked it that way! I spent a lot of time thinking up ways to reference as many things from the movie as I could. 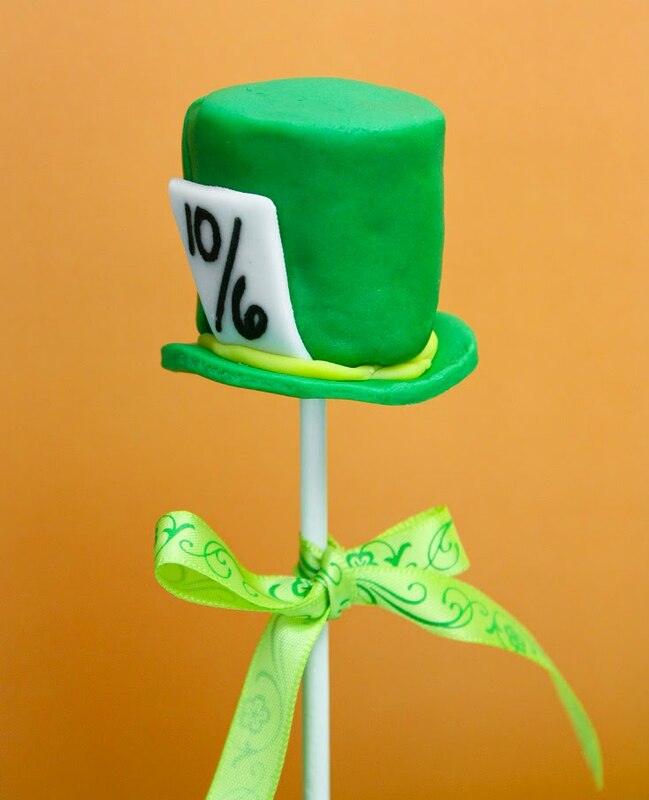 Since it was a "Mad Hatter's Birthday Tea Party" I just had to include the iconic Mad Hatter's big green hat! This is a large marshmallow covered in green fondant. The brim of the hat is a disc of fondant cut-out slightly larger than the width of the covered marshmallow. The white tag is a piece of fondant penned with the Wilton Food Writer in black. 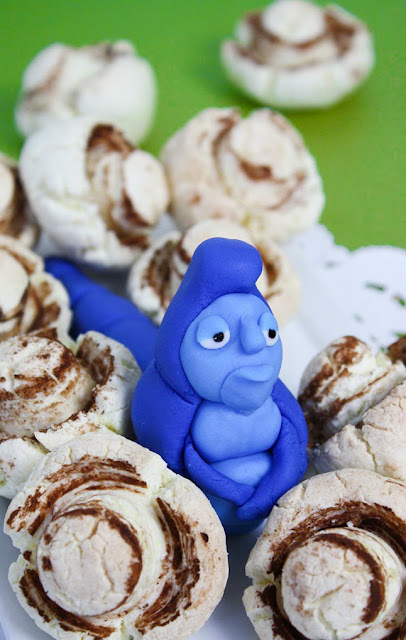 During a wild Google chase of Alice inspired sweets, I came across this which gave me the idea for a cute little blue caterpillar made of fondant. I wanted him to look as smug as he does in the movie, but I'm afraid he just looks bored (hehe), but everyone loved him. I made a tiny fez of fondant but didn't get an opportunity to get a good picture of him with it on. Also, these mushroom cookies were a perfect pairing! How cute are they? I'm including the recipe for them at the end of this post because I had a hard time tracking it down initially. I was amazed at how realistic they look! The brown fungus-y underside and stem is made by dipping the mouth of a dampened cola bottle in cocoa. You are supposed to lightly press the bottle into a small, round ball of dough but I wanted more definition. I pressed pretty darn hard. The stems were more prominent and I loved the result. A few people dressed up for the occasion. 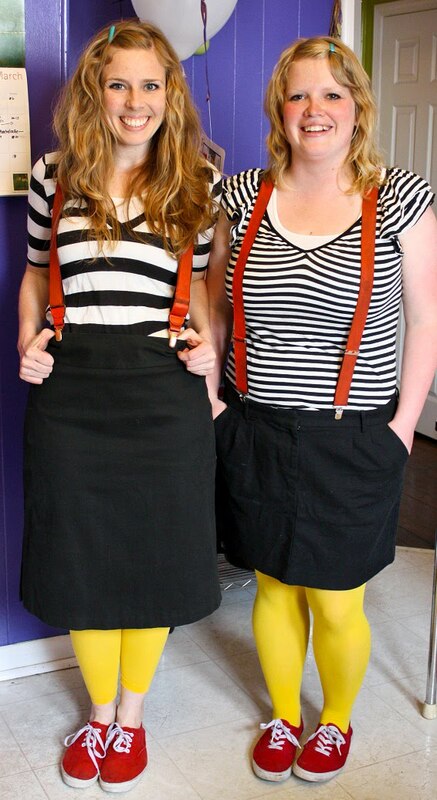 Just look at how cute Tweedledum and Tweedledee were! 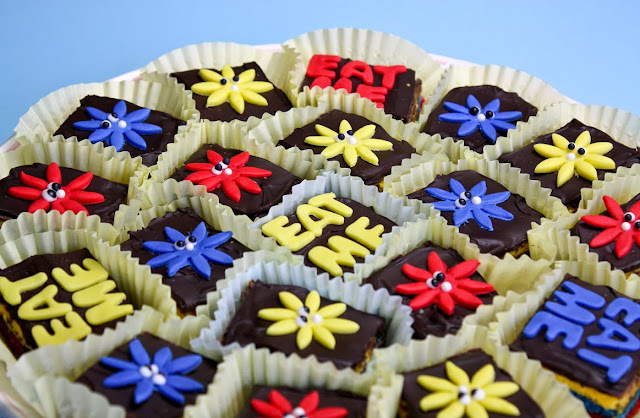 I was asked to make little cakes for the party, and my first thought was petit fours. I haven't had the best luck with poured fondant, so instead I opted for the cake-like Italian Layer Cookies I made last Christmas. Instead of red, white and green I made them blue, yellow and red. I also wanted to reference the talking flowers in the movie, so I put little fondant flowers on the cakes with royal icing eyeballs. I found myself giggling at them. Everyone loved them (tasty too!). 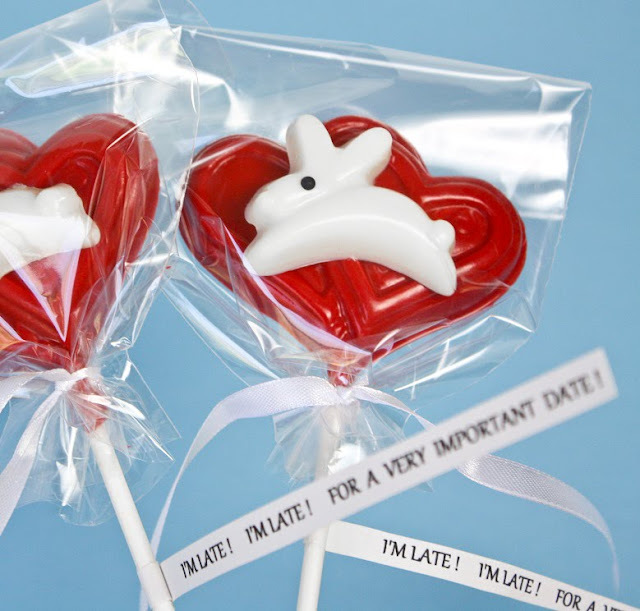 The favors for the kiddos were lollipops of hopping rabbits. 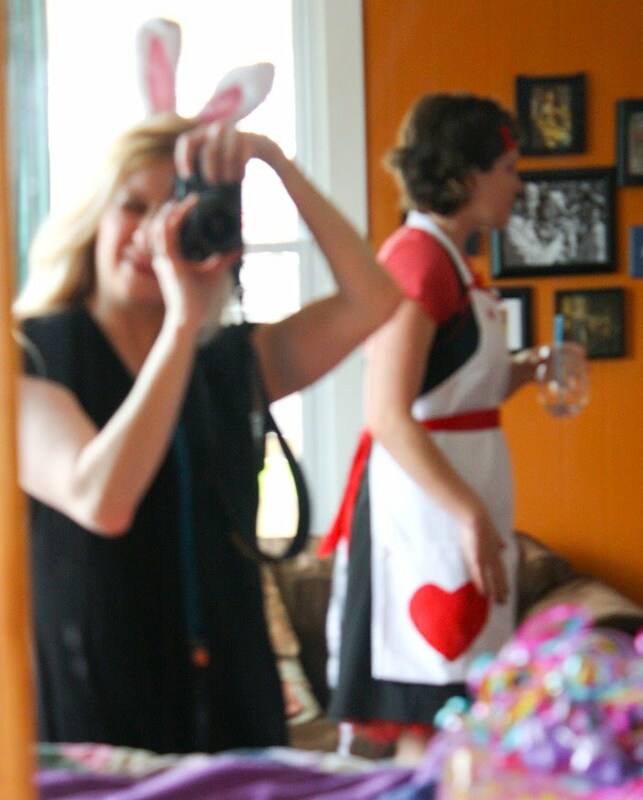 I had a heart mold from Valentine's day and an Easter mold from my recent candy making endeavor. I attached the "I'M LATE!" tags with a little Elmer's glue. Preheat the oven to 375. Cream the sugar with butter using a small egg whisk, then add the egg and vanilla extract and whisk again. Add the corn starch now mixing with your hands. Gradually add the flour and baking powder, knead. Let stand for 5 minutes. Make chestnut sized balls with your hands. 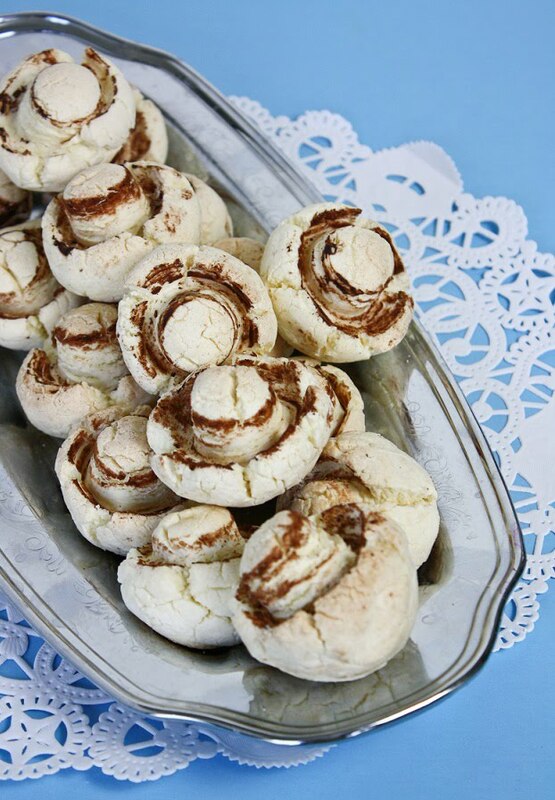 Put parchment paper on a cookie sheet and arrange the dough balls on it. Place cocoa in a small bowl and pour 1 tbsp water in another small bowl. Wash and dry a glass soda bottle. Soak the rim of the bottle into the water, then dust it with cocoa. Press the rim of the bottle into each dough ball, making a stem. Wipe the rim of the bottle with tissue paper every 3-4 times. Bake for 25 minutes. Arrange them on a wire rack and allow them to cool. There were additional items I made (last minute) that I didn't get to photograph. I made a Sleepy Dormouse of fondant and placed him in a teapot. (Harper kept smiling and saying "Mouse! Mouse!") I also made a giant chocolate chip cookie clock, some playing card cookies, and one grinning Cheshire Cat cookie. The talented photographer Morgan Trinker was in attendance taking pics of everything, so when she posts party pics to her site I'll be sure to share the link! I know the birthday girl had a great day! In fact, I think everyone attending had a fabulous time. I sure did! WOW! You were one BUSY baker! You've outdone yourself this time with your amazing talent and creativity!!! I love it all! Can't wait to see the rest! What great birthday treats. I think the Moms appreciated this more than the kids because they would realize the work that went into it. This is fabulous! What great ideas, and so creative. Love it all! I am completely in love with this party and the massive thoughtfulness behind it! Everything turned out awesome! Thanks for sharing! LOVE it! The sheer cleverness and awesomeness of this party is completely astounding! You have outdone yourself!! Heather I am totally blown away by everything you did! UNBELIEVABLE!!!! Seriously! I'm so glad to see this project completed! You did an amazing job - it's all beautiful! Every photograph is just STUNNING! I'm so beyond impressed. I posted a link to your party post at ediblecrafts.craftgossip.com. STUNNING! You made the cookies! It was fun to see the sketch and then the product. All is lovely! Will you do my next birthday party? woww that's brilliant!! 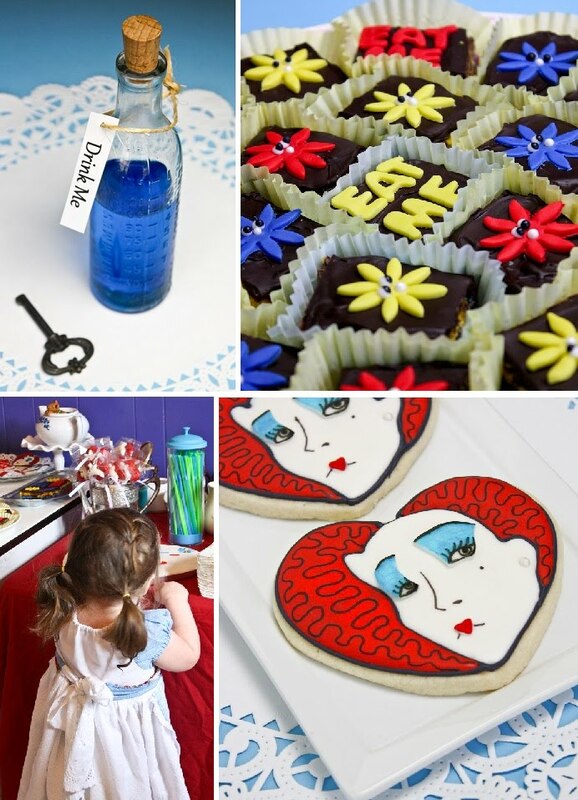 love the red queen sugar cookies especially. I admire all the work you put in all that baking! Heather, so much work and just gorgeous, every single bit! I can't even pick a favourite! Harper was a very lucky little girl to have such a beautiful party. You deserve a HUGE pat on the back! 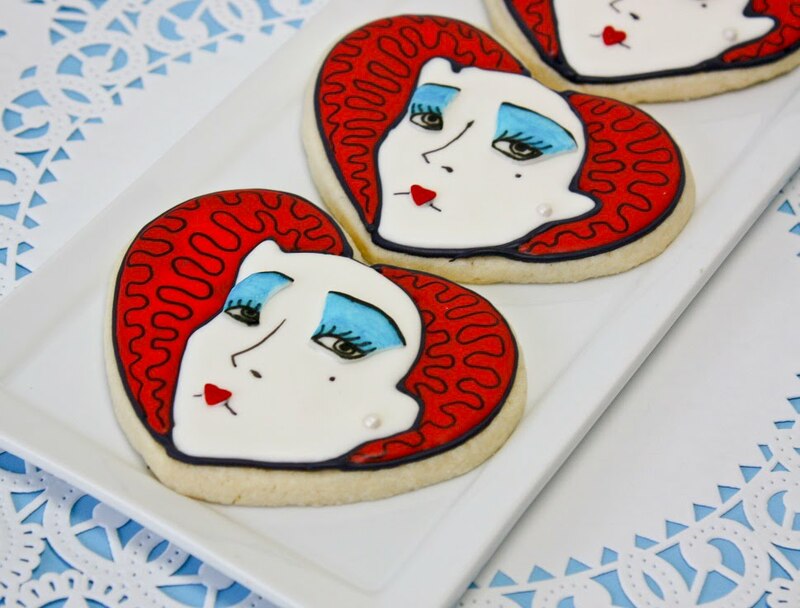 the queen of heart cookies blew me away! such the perfect design and such an amazing likeness too. everything looks like such fun! Happy birthday to Harper! This is SO CUTE. I love the mushroom cookies especially - they remind me of the mushroom meringues we made in pastry school for our buche de noels. As much as I love meringue these look easier and a lot more stable. The mushroom biscuits are SO cute, I love them! Amazing party treats...such detail. Love it! All of your creations are SPOT ON!! They are gorgeous! You really outdid yourself, i'm sure it was alot of work. But everything look absolutely fabulous. I can't wait to see more photos!! Wow, your photos are amazing! Such high quality! What kind of camera do you use? 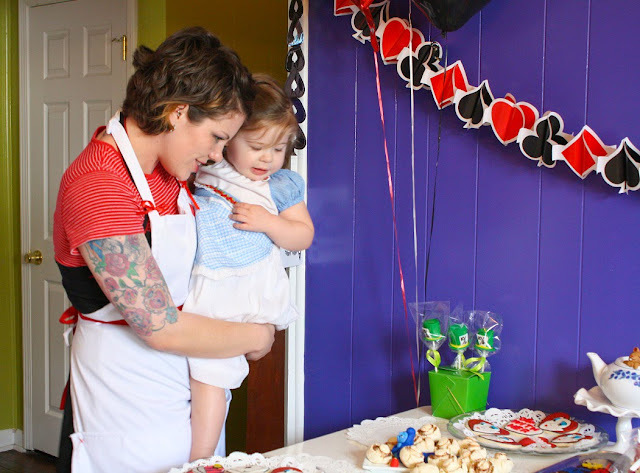 Wow this looks such a good party, I love your queen of heart cookies! This all makes me so ridiculously happy! Eee! You are amazing! So much detail...I love it! I'm just a beginning chef and you have inspired me. I love this. Alice in Wonderland is my absolute favorite book in the world and you have captured it's essence beautifully. Keep up the great work! Hey that's an amazing idea! really pretty cookies too (: do you have the recipe for the lollypops? Thanks! That is one of the most creative things I've ever seen. I used to think I did a good job with my girls' birthdays but you blew me out of the water! I am truly inspired! Wow, these are amazing! I absolutely love your blog. I am an aspiring cake decorater/baker and your blog is so inspiring. I would love it if you could check out my blog and share any tips that you might have! I know this was a long time ago, but I had a question about the recipe for the mushroom cookies. Is it 1/2 a stick of butter (quarter cup) or a whole stick and it's meant to say 1/2 cup butter? Sorry about my confusion, I just wanted to make sure I had my ratios right. Thanks! Hi! Yes - it is indeed a quarter cup - 4 tablespoons - of butter. 1/2 stick. The dough is pretty stiff, so don't be concerned if the dough is dry and crumbly. The texture struck me as odd at first, but it all works out in the end. The cookies are a bit plain, but good with tea or coffee. Call me electronically challenged, but I can't find your recipe for the mushroom cookies anywhere.. I want to make them for my daughter's Alice in Wonderland party coming up soon. They look delicious! Do you mind commenting the link to the recipe, or telling me where on the page I can find the link? Thank you so much! Hi Brenda! Not your fault at all - I've fixed the recipe. You should be able to view and print. Thanks for the heads up!